Tony Sagami writes: Have you become more optimistic about the stock market? If you listen to the experts on CNBC, you might think that a great bull market is right around the corner. Our county’s industrial output — the combined production of our factories, mines and utilities — has dropped by 13.3 percent since the recession began in December 2007. That’s the largest percentage decline since the end of World War II. In the last 12 months, industrial production has declined by 12.8 percent, and the numbers keep getting worse. During the first quarter of 2009, annualized industrial output fell a staggering 20 percent. Not only has our nation’s factories’ output plummeted for five quarters in a row, capacity utilization at those factories has tumbled all the way down to 65.8 percent. That’s the lowest rate since the data was first collected in 1967. And it shows that one-third of the nation’s manufacturing capacity is idle. 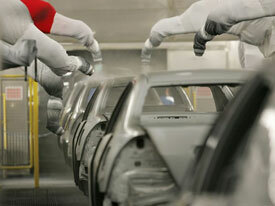 In the first quarter of 2009, our nation’s annualized industrial output fell 20 percent. That weakness is spreading to the financial markets, too. For example, the spread between the Merrill Lynch junk bond index and 10-year Treasury note has soared to 1600 basis points from 800 basis points a year ago. What’s more, according to Standard & Poor’s, 367 companies (a record high) cut their dividend in the first 90 days of 2009, and 83 (a record low) companies raised their dividends. Americans are also feeling the pinch. The National Retail Federation reported that retail sales dropped 1.1 percent in March and are down a disturbing 10.6 percent from March 2008. While GM, Ford, and Chrysler are moaning about weak car sales, the new car market in China is booming. New car sales in China hit a record 1.1 million vehicles in March, the third straight month of improving sales. Even more impressive: More new cars were sold in China than in the U.S.! China’s trade surplus surged to $18.6 billion in March. The U.S. may be buying fewer Chinese exports. But somebody is buying a whole lot of Chinese goods. In fact, China’s trade surplus skyrocketed from $4.8 billion in February to $18.6 billion in March. That means China’s battered manufacturing industry is bouncing back. One of the major millstones around the U.S. economy’s neck is the failure of our banks to loan money … even when it is given to them! According to The Wall Street Journal, the biggest recipients of taxpayer aid in the financial sector loaned out 23 percent less money in February than in October. 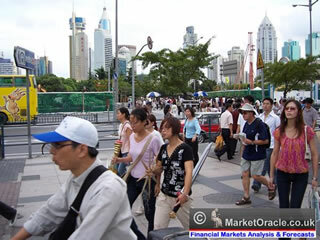 However, in China banks have loaned out 4.58 trillion yuan in the first quarter of 2009. That’s almost as much as the 4.9 trillion yuan that was loaned out in all of 2008. Money supply is the key ingredient to economic growth. And liquidity is showing up very clearly in China’s money supply numbers: Money supply, as measured by M2, jumped 25.5 percent in the first quarter from a year earlier. Non-Chinese investors see the writing on the recovery wall and are jumping back into China with both feet. Foreign direct investment increased to $8.4 billion in March, the highest amount since June last year. Unlike the U.S. where retails sales are shrinking, retail sales in China are growing like a weed. Chinese consumers spent 14.7 percent more in March than they did a year ago. China’s manufacturing industry is bouncing back — industrial production was up 8.3 percent last month. Unlike the U.S., China’s industrial production increased by 8.3 percent in March. For a country like China, 8.3 percent is not exactly what I would call booming. But that sure beats the heck out of shrinking! All of the above aren’t statistics that I’ve been accumulating over time to paint a pretty picture of China. They are economic releases from the past week and are the most timely view of how strong things really are in China. Consider using the recent strength in the market to reduce your exposure to U.S. stocks. Because if you believe that … a shrinking economy leads to smaller corporate profits and crumbling stock prices … you have to know that stocks are headed lower in the U.S.
And if you’re selling your U.S. holdings, where should you put your money? In my opinion, go where the economy and corporate profits will be growing the most: China.